The yellow metal dropped nearly $20 on Thursday as the US and China make progress on discussing a trade deal. However, sluggish manufacturing numbers from the US and the EU limited additional declines of the safe-haven. While optimism at trade front dragged the yellow metal downwards, economic calendar flashed alternative signals. The US durable goods orders grew less than expected 1.5% to 1.2% in December while Markit flash manufacturing PMI posted 53.7 against 54.9. In case of Eurozone details, Markit Flash manufacturing PMI slumped into contraction region with 49.2 reading compared to 50.5 prior. Looking forward, developments surrounding a trade deal between the US and China are likely to act as a major market catalyst while comments from ECB & Fed policymakers could also offer trade opportunities. 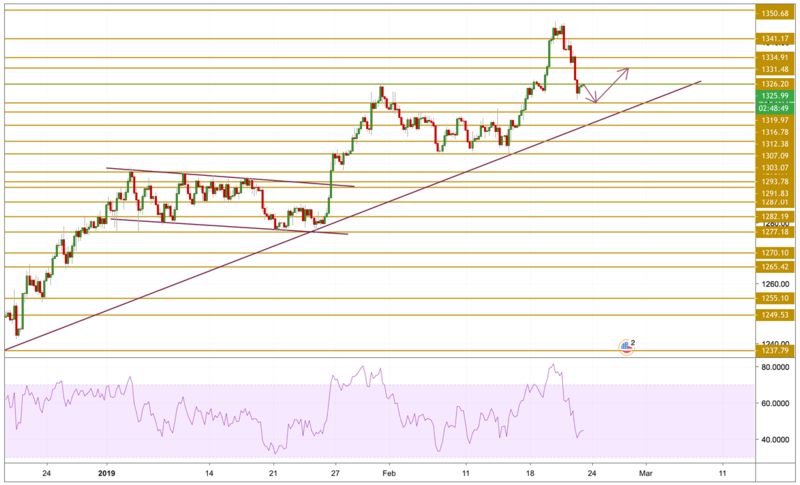 After surging to a ten-month high of $1346.61 per ounce, Gold prices reversed failed to keep on hold on the top and declined nearly 20$ during yesterday's session. The price is currently trading just below the $1326.20 resistance level with a bearish momentum. A further downward move towards the 1319.97 level seems to be more probable before regaining traction.